I’ve learned a lot through my hideous experience of depression and my long, slow, bumpy recovery and, although I forget a lot of this new-found wisdom most of the time, I’m determined not to let it go to waste. Putting this learning into action is my best chance of fending off any future attacks from my nemesis and staying well. So, here are the most important things I’ve learned. They might seem obvious, but these are all things I couldn’t do when I started counselling in 2010. I’m bound to have forgotten something vital, but, in line with point number 2, I won’t beat myself up about it. 1. Learn to accept ‘good enough’. You can’t do everything to the absolute best of your ability the whole time, Mr Perfectionist, and you can’t please everyone all the time. Most situations are not a case of all or nothing. Save your best for when you really need it. Imagine you’re a car – too many extra miles and you’ll find yourself in the garage. 2. Give yourself a break. Stop criticising yourself and putting yourself down. Stop setting yourself unnecessary targets and challenges. Work out what your strengths and qualities are, and remember them. Ask someone else if you don’t know what they are. I did. Write them down if that helps. 3. Don’t worry about what other people think. More often than not, you have no idea what people are actually thinking, and are probably jumping to the wrong conclusion, so you’ll end up taking everything personally. And don’t worry what people think of you. Define yourself on your own terms. Only you have the right to decide who you are and what you do with your life. 5. Don’t think when tired. Nobody is at their best when they’re tired. Tiredness really does affect your state of mind. If I start thinking when I’m tired, I end up in imaginary arguments, over-thinking everything and feeding paranoia. Distract yourself with some music or whatever works for you. 6. Find time to do something you enjoy. Do it because you love it. Not everything you do has to achieve something, so stop the striving – enjoying something is a result in itself. Everyone needs to relax. Nobody is invincible. 7. Savour the moment. Recognise when you feel good. Notice when you are enjoying something. Write it down – maybe in a diary, like the one I started keeping during my depression and still write in. Take a photo. Remember it. It’s your evidence against the voice that says everything is miserable and hopeless. You are too concerned with what was and what will be. There is a saying: Yesterday is history, tomorrow is a mystery, but today is a gift. That is why it is called the present. 9. It’s not weak to ask for help. Talking to someone about how you’re feeling can change – or even save – your life. Don’t try and keep it in through some misguided sense that you are tough, strong and can handle anything and everything. That’s not tough or strong – it’s daft. 10. Don’t stop believing. When you’re in a dark place, believe the light will return. Keep hoping. Keep the faith. Believe things can improve and you can get better. You just don’t know what’s coming next, so don’t write off yourself or your future. 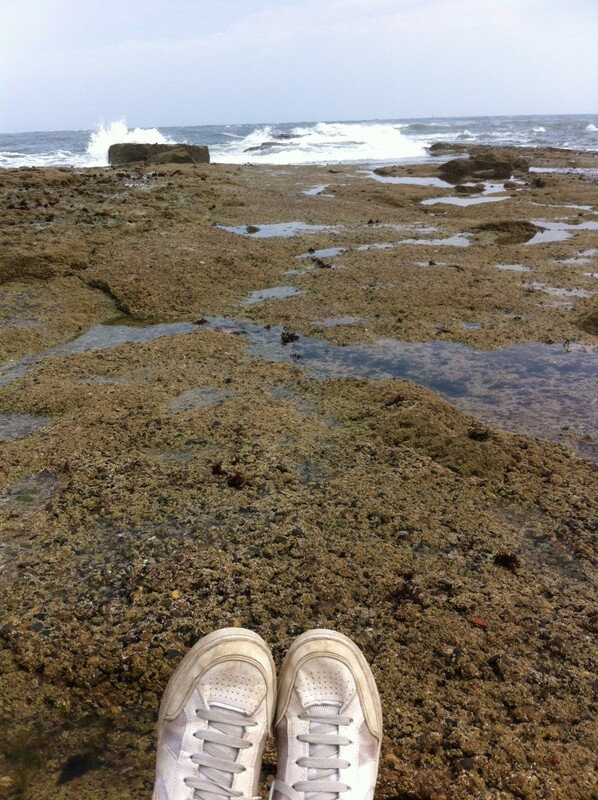 Savouring the moment on a trip to one of my favourite places – Filey Brigg. Excellent post. Thanks for sharing the most important things you’ve learned. I am going to try to put some of these into practice. Thank you very much, Phoenix. I have to keep remembering them myself too! I think you’ve summed it up beautifully. Thank you for these insights. For me #1 is noticing and rejoicing in when I feel good. Sometimes I’m almost taking those times for granted, and then I remember how unspeakably, revoltingly, abysmally low I felt this time last year and for so many months – and I notice and rejoice, and give thanks!! Hi Alice. I know exactly what you mean! It’s like not seeing the woods for the trees….. I get all those feelings exactly but didn’t think I was depressed to that extent … obviously tis a bit worse than I thought !, but now I can see the woods I feel better armed to cope with PEOPLE .. because I do believe that it is the actions of others that depress you more than anything else .Thanks for your thoughts and may you continue to grow. Thanks Des. Glad the woods are coming into focus. Thank you. Those are hard things to manage but so important. I am still learning! All so true Paul. Been there for the last year or more but didnt get help till sept last year. Went back to work 4wks ago after 3 months off. I’m still on medication and still fighting but am alot better than I was. I’m having alot more good days than bad, tho things have slipped slightly these last 2 wks. Its so true how all the above can make such a difference, especially the tired one for me. I have some of my worst thoughts when I’m tired. It magnifies everything. I will get there, it is going to take time. I have so good friends even though I don’t like to burden them cos I feel like i’m going round in circles. Hi Caz. So sorry to hear you haven’t been well bit good news that you’re making progress now. Recovery can be painfully slow, and there are dips – big and small – when it’s easy to think you’re going backwards, but I have learned that is all part of getting better. Let me know if you ever want a chat. Best advice ever! Thanks, been following your blog since depression last year and through my recovery. Can’t tell you how fab it’s been – exactly what I needed: practical advice, realistic expectations and no scare stories about how anti-depressants would ruin my life / make me a different person / grow an extra limb. You’ve really helped me through my depression. Thank you very much, Kate. Those are lovely comments for me to read. Some of us have life-spanning chronic depression that make a few of these harder than most, but I’ve found #5 to be very helpful for me, especially in the last couple years of my latest depressive resurgence. If I’m edging toward a breakdown and crying a lot, I now know I should probably go to sleep. I usually feel better when I wake up, or at least I feel less, which is just as good at those times. Yes, sleep is so incredibly important. I found it hardest when I had insomnia and then had to try and function the day after. Yeah, I have a lot of sleep problems, too, but it’s been helpful to at least try to stay aware of that factor. Thanks for your comments. I appreciate what you’re saying about ‘before’ and ‘after’ and would never knowingly exclude anyone from anything. However, I also can’t write to suit everybody, as I write about what has happened to me, where there was a very distinct time before depression. ‘After’ is less clear, but when I use it I am usually referring to the time after my worst spells. I like to think I can offer people some hope, whether it’s for recovery or, as you say, the ability to manage, but am always learning and don’t know other people’s experiences or conditions as well as I know my own. It is a helpful point about language and I will keep it in mind for future posts. All very good, sensible, true lessons to keep us all going. And having written them down, you can help yourself keep believing. Would you be happy for me to share these with others I know who would find these helpful? Thanks Kate. I need to print them off and keep them as a reminder! Yes, please do share – thanks for asking. Great insights abd something I can identify with. I have bipolar and need to try remembering and applying some of these when up as well as down. Thank you for sharing. Thank you very much. They’re often the hardest things to remember and do, and need practice! Thanks Paul, I’ve got some clients that I would like to share this list with that are all at different stages of recovery from depression. One of the things that dessert you when depressed is the ability to cope. It’s good to be reminded that you have coped before and that will come back to you in time. That’s so true, Nicola. And yes, reminders are useful – I’ll have to print off my own advice so I don’t forget it! Hope the blog helps your clients. Not being long out of a mental health hospital and still trying to find my way. Its always good to see a few words that ring true. I could really have done with this in a poster from that would have hung from my wall. Just a little reminder of how to see things when all those around you are TELLING you what to think. Great words, great blog and a little more hope added for my recovery. Reblogged this on Manippy Dippy Tactics. A very good friend just sent me the link to this. It is one of the best articles I have read for some time. I am on the bumpy road and this sums up beautifully what I need to do. Thank you very much, Sara. I have to keep this list for myself and keep referring back to it. This is so well written and helpful Paul. It’s interesting how all sufferers experience things differently and thus how they respond to things on the list. So for me, the reminders to try to put aside resentment, and not to reflect too deeply on the past or worry too much about the future are critical. Of course, saying these is easier than doing them, but being aware of their importance is the first step to doing them successfully. Thank you, David. I find the different things on the list take it in turns to demand attention, so I have to try and remember not to neglect any of them. With time and practice, I think they should become part of life without me having to remind myself. Great post, Paul. one I will save and come back to. Hope you are well & all the best. Steve. Yep, don’t we all! Cheers & all the best.